Because I can not speak anything other than Japanese, I use a translation application in other languages. There may be difficult words to convey. I like cross stitch and miniature leather craft. cross stitch history 30 years, miniature leather craft history 6 years. 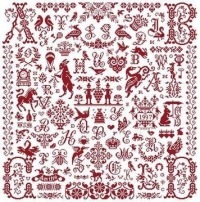 There is no sampler like an overseas design in the design of cross stitch in Japan. I like samplers and monochrome designs, so it's fun to see everyone's designs. I thank my friends for sharing the design.